I would like to share with you some thoughts on Forgiveness, a word that carries a quiet peace with it. So often we can be inclined to carry around a great deal of negative emotions: hurt feelings, anger, criticism, self-righteousness, and self-justification, when recalling unkind, even hateful, things that have been said or done to us. We are hurt or offended because we feel we really did not deserve such treatment. Most likely we didn’t deserve the thoughtless remark or act of unkindness, and it is easy to allow our mind to take offense and become filled with negative emotions. Only forgiveness can bring a sense of gentle, quiet peace that an angry, offended mind cannot have. Being above personal emotions, learning to forgive and forget, can lead to spiritual enlightenment because our minds are free to be receptive to God’s thoughts. We close out God’s thoughts when our minds are filled with anger, hurt feelings, and self-justification. When we cannot forgive, we often carry around with us the habit of mentally rehearsing an offensive incident and continually justifying our anger and hurt feelings. We can begin to forgive by telling ourselves that perhaps there was no intent to offend. If this is the case, we can quickly forgive and let it go. Even if there seems to have been intent, it is important to defuse personal sense by seeing the perfect man instead of a mortal man. Only through forgiveness can we maintain spiritual inspiration. Only when we don’t allow personal sense to rehearse the unkind remarks or acts of others can God’s thoughts reach us which is a prerequisite to healing. In Miscellaneous Writings (7:7), Mrs. Eddy tells us, “Great humility and charity are necessary in this work of healing.” For an inspiring lesson in forgiveness, I recommend reading “Taking Offense” found in Miscellaneous Writings page 223. 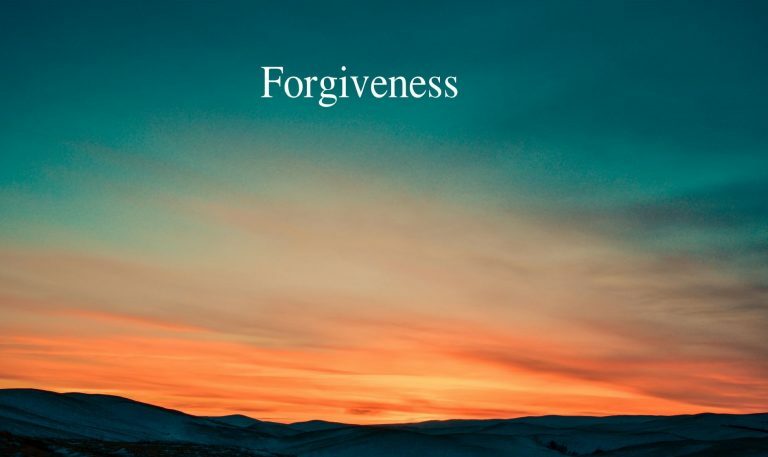 In this brief article, our Leader sums up forgiveness so lovingly, and her words give us the reassurance and guidance that she must have used in forgiving those who made her work so hard when she was trying to establish the movement. Her brief remarks in “Taking Offense” are relevant to our world today because there seems to be so much disagreement, anger, and division. Can we afford to be angry and offended when someone cannot agree with our viewpoint or our opinions? Without forgiveness we are forgetting one of the founding principles of this great country. It is such an important concept Christ Jesus included it in The Lord’s Prayer. Let us pray for forgiveness not only for ourselves and others but for the world to become more forgiving in an age where the stakes are so high. We are now offering two Association addresses of a very popular teacher and lecturer from the past, Herbert E. Rieke. Volume I of his association addresses includes “No Big Power Veto” from 1948 and “Immortality” from 1949. “Now, every religion and philosophy on earth, except Christian Science, teaches that you and I -everyone- live in a state of mortality. They teach that everyone is born into matter or mortality on a certain day of a certain month of a certain year. The world has accepted this lie as though it were true and has paid the taxes of suffering as a consequence. A LOVELY COLLECTION OF MRS. EDDY’S POEMS. This soft cover book has just been published. Having been carefully researched, many of the poems have the source and date when they were published and covers most of our Leader’s lifetime. We can begin to know some of the moments of joy and sorrow that she felt and reflected in her poems. They tell us what she felt about the Civil War, political upheaval, sickness, mourning over the loss of loved ones, and also her great joy and expectation for the future. The poems help give us another insight into her spiritual nature. Many books and memoirs have been written about her, but perhaps her own words reveal the real Mrs. Eddy best. One brief poem shows us. Then rest in Him today — forever. In Retrospection and Introspection, Mrs. Eddy says “The first edition of my most important work, Science and Health, contains the complete statement of Christian Science… (and) was published in 1875.” (page 37). The Evolution of the Christian Science Textbook represents several years of careful research into earlier editions. It traces the development of our Textbook through seven clearly defined stages and seven major revisions: First edition in 1875; Second edition; 1878; Third edition in 1881; Sixth edition in 1883; 16th edition in 1886; 50th Edition in 1891; 228th edition in 1902 which became the final edition in 1910. This study of the evolution of our Textbook enhances our understanding not only of Science and Health but of its author, and the ceaseless labor she poured into these divinely inspired pages, destined to bring healing to all mankind for all generations to come. This is a special edition of Science and Health in large print, with a new index added at the end of the Textbook. No change has been made in the textbook that we now study. The creator of this index, Elizabeth Barber, explains why she found an index necessary. “When I returned to school, working for a doctorate degree, I had to write a thesis and the work had to have an index. I began thinking, during that time, that Science and Health should go into the university libraries. But I discovered that an index was required for all books at the college level. Since Science and Health did not have an index, I decided to take this on. I did not change one word, or even one punctuation mark of the original textbook. Why would I change anything that has healed me so often? This lovely, soft-cover indexed copy of the textbook has large, dark print. It is filled with information about those who are named in the textbook and it gives the origin of the 790 Scriptural selections in the book.